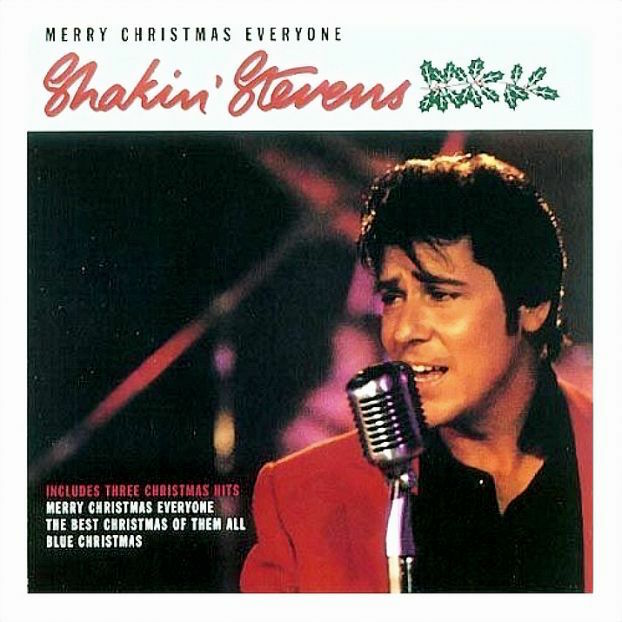 Today’s POP RESCUE is the 2005 re-release of 1991’s a Merry Christmas Everyone – an album by one of the greatest 80s Christmas hit makers – Shakin’ Stevens. You’re either going to love Shakey, or you’re going to find this album incredibly annoying. Having opened the case, I’m right there on the fence – able to sit through most things, but will I survive for the whole album? There’s something to be said about Shakey – he hasn’t realised that the 50s have passed. That actually plays to his benefit, with this sounding pretty authentic in an 80s time traveler going back in time to sing original 50s songs back in the 80s. Confused? Oh, let’s just press ‘play’. This 12 track album opens fittingly with a big, fast guitar riff in the shape of original track Rockin’ Little Christmas. It’s certainly an up-tempo track. Not particularly memorable for Christmas, but good fun all the same. Next up is the classic Irving Berlin track White Christmas. A meandering piano, and male backing vocalists, ensure that Shakey keeps his version right there in a 50s feel, and it works pretty well. The pace picks up again for Sure Won’t Seem Like Christmas – one of four Shakey co-written tracks (this one with Ronnie Harwood). The bass and piano keep the pass running, and the backing vocals return, and it’s a pleasant enough romp through a not particularly Christmassey feeling song. I’ll Be Home This Christmas is good – opening with twangling guitars before Shakey takes the vocals, and his backing vocalists provide a nice warm backing, whilst the drummer gives the cymbal some hell. They must have been glad when he got home. This sounds like it’s probably been used on an 80s kids film. Maybe the Gremlins. Christmas wouldn’t be Christmas without THAT big hit, the album’s title track Merry Christmas Everyone – a huge 80s hit, and always a highly ranked contender in those Top 100 Christmas Songs list programmes. This song was released in 1985 – held back a year so that it didn’t clash with the Band Aid original Do They Know It’s Christmas? song. It did the trick – reaching the 1985 coveted Christmas #1 slot in the UK, complete with sleigh bells and perfectly Christmas video. The success of this video, and changes in the UK chart, has meant that this song charted every Christmas from 2007 until at least 2013. Will it chart again this year? Next up is a Shakey cover of the traditional song Silent Night. This comes complete with trademark ‘ooh, bop-bop‘s from his backing vocalists. In the sleeve notes, Shakey writes about this track and White Christmas: ‘.. I didn’t just want to do them the way they have been done, time and time again. Instead I decided to put my personal stamp on these traditional Yuletide standards’. He certainly does this (with both), but I’m curious as to how this might have sounded if he had gone for a more traditional style. The seventh track is another original co-write – It’s Gonna Be A Lonely Christmas. It reminds me somewhat of Mud‘s 70s hit Lonely This Christmas, not just in topic, but a bit in style too. The next track is the lead single from the 1991 version of this album – The Best Christmas Of Them All, which was released in 1990. This is actually a really good song. I’m surprised that I’ve not heard this song on a few more Christmas compilations, or playing in shops, or at my gym.. It’s a catchy song, and this took it to #19 in the UK singles chart. The pace drops for Merry Christmas Pretty Baby, which seems to take Shakey as close to Elvis as he can vocally get over a pretty slinky, jazzy, at times bluesy band. Penultimate track is Blue Christmas, which Shakey reveals in the sleeve notes as being ‘my very first seasonal recording’. This of course is most famously by Elvis Presley, but originally by Doye O’Dell. The album closes aptly with So Long Christmas, in which Shakey celebrates the end of a year, reflecting on the past months and spending time with friends. And so the album closes there. I’m okay with this album. There’s a few gems lurking here (Merry Christmas Everyone, Christmas Wish, and The Best Christmas Of Them All) but the rest is pretty much typical Shakey style, and with very little variation. The sleeve notes even reveal Shakey’s own reservations about it: ‘When Epic [his label] first asked me if I would like to record a Christmas album, I wasn’t too sure. But after giving it some thought, I agreed. I didn’t want to do the obvious traditional Christmas covers or a collection of the standard Holidays hits. I wanted to make a unique rock ‘n’ roll Christmas album’. A whole album of this music is a hard listen for me. Shakey as a singer, and the band, are perfectly capable of pulling the hits, but this is just a little too much for me in one go. Pass me the Earka-seltzer. Where is Shakin’ Stevens now? POP RESCUE 2014 RATING: 2 / 5 – shakin’ but not stirred. POP RESCUE COST: £3.50 from an eBay seller. Posted in 2000s, Christmas, Shakin' StevensTagged 1991, 2005, album, Blue Christmas, Christmas Wish, John David, Merry Christmas Everyone, remastered, review, Ronnie Harwood, Shakey, The Best Christmas Of Them AllBookmark the permalink.